The first indication of an uneven lawn cut is an immediate call for action. A couple of things will cause a deck to cut unevenly. Bumping against an obstacle while operating the mower is common, while hanging the edge of the deck on a slope or incline is another possibility. In either case, a readjustment of the deck is necessary. Position the mower on hard, level ground. Attempting an adjustment of the deck on uneven ground will result in less than optimum results. Arrange the mower blades in a perpendicular position to the lawnmower. Measure from the tip of the outermost edge of both the left and right blade to the ground. A difference of 3/16 inch or less between the two measurements is acceptable. Locate the leveling brackets on the right- and left-hand side of the mower deck. On the low side, adjust the deck up by removing the hairpin and washer from the adjustment pin with needle-nose pliers. Rotate the leveling bracket to the next hole and re-insert the pin. Adjusting to a leveling hole nearer to the rear of the mower raises the deck. Holes nearer to the front of the mower lower the deck. Recheck the deck by measuring the distance between the blade tips and the ground as before. If the difference between the two is less than 3/16 inch, the mower deck will cut level. 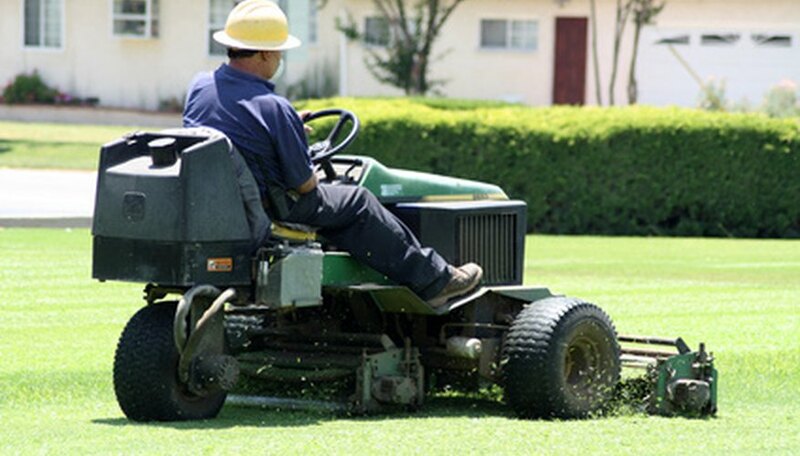 Check the mower deck periodically to maintain a level cut lawn. Wear gloves to help prevent pinching or cutting hands.